Welcome to Dhanam Electricals, Importer and Distributer of Automation Products. The company was established in 2004 in Chennai. We cater to automobile and chemical Industries. Cost effective products, faster delivery schedule and Easy Payment modes are the factors that help us to stay ahead of our competitors. We offer a wide assortment of Temperature Controller, Thyristor, Power Regulator and Wind Mill Accessories. 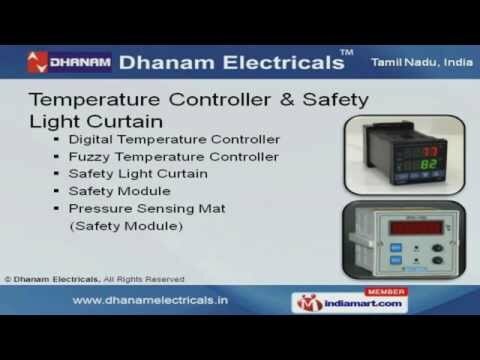 Temperature Controller and Safety Light Curtains offered by us are well known for their outstanding performance. Our Photo Sensors, Panel Meters and SMPS Power Supply are highly efficient. Thyristor, Power Regulator and Wind Mill Accessories are widely acclaimed in the market. We are instrumental in offering a wide array of Industrial Transducers, Relays and Proximity Sensors that are setting a performance standard in the market. Along with that we offer Energy Management Equipment and Monitoring Relays that are superior in performance.